SyvirMon - Standard Edition enables you to monitor the performance of your computer. With SyvirMon you can receive alerts when your computer is under heavy workload.SyvirMon does not intercept and change any data on your computer, the program just monitors changes that take place on your system. Once the program is loaded into the System tray, SyvirMon can be left to monitor your computer in the background. When in Monitor mode SyvirMon produces three alerts based on the workload of your system. A Red icon appears in the system tray when the computer is under heavy workload. A green icon means the computer is running OK!. Visually monitors the load on your computer systems processor. Monitors how much physical and virtual memory your computer has left. Monitors how much disk space is available. Produces alerts depending on your computers workload. Virtual Computer is included with SyvirMon. 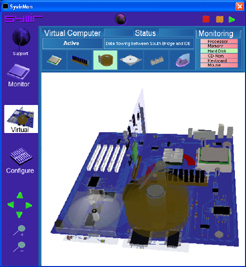 SyvirMons Virtual Computer is a powerful simulation of the main processes involved in running applications and using hardware on a Windows Personal Computer. Mouse When you click with computers mouse button Virtual Computer simulates what is going on inside your computer, with Virtual Computer you can see the path the data travels along on the virtual motherboard. Keyboard The virtual motherboard displays the data path a key press takes as it journeys to the computers CPU. 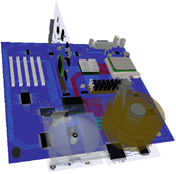 With virtual computer you can see the path the data travels along on the virtual motherboard. Processor (CPU) Virtual Computer monitors the computers processor as load changes are detected.Memory Card Virtual Computer monitors the physical memory on your computers motherboard for changes in the available memory.Hard Disk Simulates data being read/write from a IDE hard drive (XP Only). Data is read/write from the hard drive and simulated through the South bridge to the North bridge into the CPU. This is simulated in real time when the computers hard disk has a read/write cycle virtual computer simulates the heads moving on the virtual hard drive, as data moves through the controller the data lines turn to red. SyvirMon requires a PC running Windows XP (Service pack 2)/Vista/7 and DirectX 8.1 or higher. All prices exclude local taxes.